We are fortunate to have a wonderful group of horses at Hope Springs since our riders form real attachments and friendships with their horses. Each rider rides the same horse every week, which allows them to get to know each other well. Such continuity is especially important in equestrian therapy and helps our riders to develop trust and confidence. We make sure riders have the same instructors and volunteers each week, too. This attention to detail and caring is part of what makes Hope Springs an exceptional place for children and adults with disabilities. Please meet some very special members of the Hope Springs family! 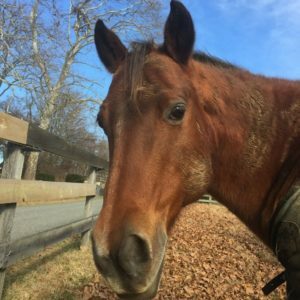 This 18-year-old Quarter Horse brings pleasure not only to our severely physically disabled riders, but to those who are learning more advanced riding techniques. Her moderate size makes her a special friend for many of our riders. "J Lo is good listener." "J Lo is patient and skilled enough to handle the severely disabled." "J Lo is well behaved and good in shows." "She has given my grandson confidence around & on her!" This 15-year-old Haflinger cross is the cutest little pony. Her gait makes her a wonderful therapeutic pony for all of our riders, but she is especially good at taking care of (and gently challenging) our independent riders. "When she trots she's really bouncy and it's fun. It's easy to groom her, and she's cute." "She knows how to take care of riders and challenge them to ride their very best at the same time!" "Cricket is just the cutest perfect pony for smaller students." This 29-year-old little brown pony came to Hope Springs to help carry our smaller riders. When Norman isn't busy giving lessons, his favorite pastime is galloping around the pasture with his best friend. 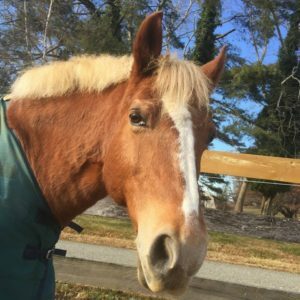 "He can hang with the big boys :-)"
This 15-year-old Haflinger is a rescue pony found wandering the fields of Virginia. Although we don't know what Henri did before joining our family, he learned his new job quickly. In between lessons, this mischievous pony loves to try to get a rise out of his stable mates. "I love his white eyelashes." "He has attitude and showmanship!" "He's a handsome pony with a huge personality!" Marshall is a 14-year-old percheron/thoroughbred who came to HSET in 2017. He is a gentle giant who takes his job as a greeter in the front of the barn very seriously. Marshall loves to be with people and to have his belly brushed. He is well-mannered in the barn and indoor but loves to be on a trail ride the best! Cody is a 29 year-old appaloosa who came to HSET in 2017. He is our resident ladies man who loves to talk and show off his handsome mustache. 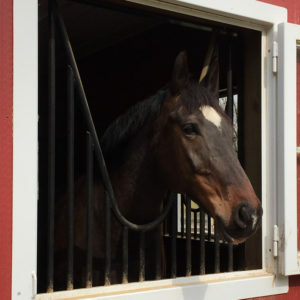 Cody loves to be in the indoor with his riders and takes care of young riders and adults. 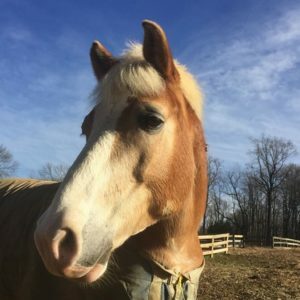 His easy gate and happy personality make him a fantastic therapy horse. Our 6-year-old chestnut thoroughbred used to be a race horse, but not much riles up our Tigger Too! This chill guy takes care of some of our adult riders but also loves to carry smaller children on his back for trail rides. Tigger enjoys being told how silly and handsome he is and helping his buddy Marshall greet visitors to the barn. 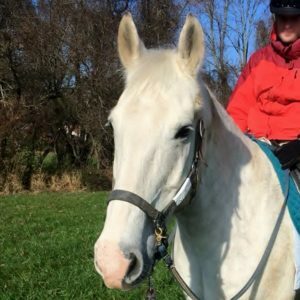 A 14-year-old grey Irish Sport Horse who comes from Ireland! Hamilton recently joined our program where he is settling in nicely. Hamilton likes to go for trail rides with his riders and to get as dirty as possible! 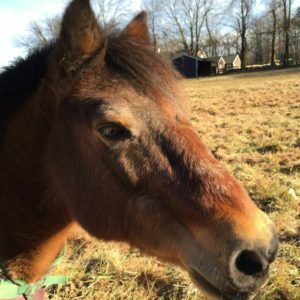 Would you consider "adopting" a therapy horse? Naturally, the care and feeding of our horses is a top priority to us. Quite simply, the quality of our therapy relies on having well trained, healthy horses. Feed, blacksmith services, and veterinary care form a substantial portion of our budget - in fact, it costs an average of $500 per month to care for one horse. 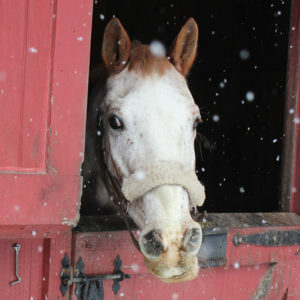 Some of our horses are older; their patience and "I've seen it all" attitudes make them perfect for many of our riders. However, like all of us as we age, they require a little bit more care and oversight -- and dollars -- to maintain their health. Would you join us as a partner today and consider sponsoring a horse for a month, several months or a year? 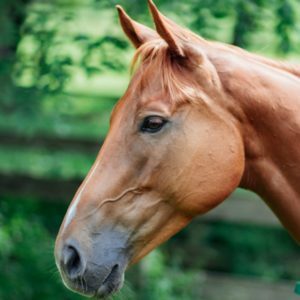 Your participation would help to ensure that our horses receive the best of care and that our riders fully experience the many benefits of quality equestrian therapy. You can be assured your gift will touch many lives and will be deeply appreciated. To participate, donate here.